Now past the quarter point of the season, Week 6 kicks off with an interdivisional game when the Montreal Alouettes visit the Winnipeg Blue Bombers for Thursday Night Football, kicking off at 8:30 p.m. ET. With first place on the line in the West Division, the BC Lions will look to avenge their Week 1 loss to Edmonton, who look to increase their undefeated streak to five games. This Friday Night Football match kicks off at 9:30 p.m. ET. Saturday has two games on tap to conclude the week. First, the Argonauts will visit the new Mosaic Stadium in Regina to take on the Saskatchewan Roughriders at 6:30 p.m. ET, followed by the Calgary Stampeders hosting the Hamilton Tiger-Cats at 9:30 p.m. ET. - Saskatchewan’s Kevin Glenn became just the seventh quarterback in CFL history to reach 50,000 passing yards. He joins Anthony Calvillo (79,816), Damon Allen (72,381), Henry Burris (63,639), Rick Ray (56,779), Danny McManus (53,225) and Ron Lancaster (50,535). - It took Glenn 273 games (195 starts) to reach the benchmark. - Glenn, who is currently seventh on the all-time list with 50,087 passing yards, is only 448 yards away from the sixth spot, currently held by Ron Lancaster. - Glenn is also eighth on the all-time touchdown passes list with 275. He’s nine touchdown passes shy from tying Tracy Ham (284) for seventh on the list. - Nik Lewis joined the 1,000 Reception Club early in the second half of Wednesday’s game when he caught his fifth pass of the game. - Lewis trails only Geroy Simon (1,029), Ben Cahoon (1,017) and Terry Vaughn on the all-time list. - It took Lewis 217 games to reach the milestone, making him the second-fastest receiver to achieve the feat. - Lewis’ career stat line: 1,003 receptions, 13,387 receiving yards, 71 touchdowns and 30 games of 100+ yards. - The next active receptions leader is Winnipeg Blue Bombers receiver Weston Dressler, who has 640 receptions – good enough for 17th all-time, five back from Travis Moore (645) for 16th. - Charleston Hughes had a vintage game against the Saskatchewan Roughriders. Hughes recorded a hat-trick of sacks, giving him four sacks on the season and 92 in his career. - Hughes currently sits 13th on the all-time sack list and is four sacks away from moving into 12th in place of Mike Walker (95.5). 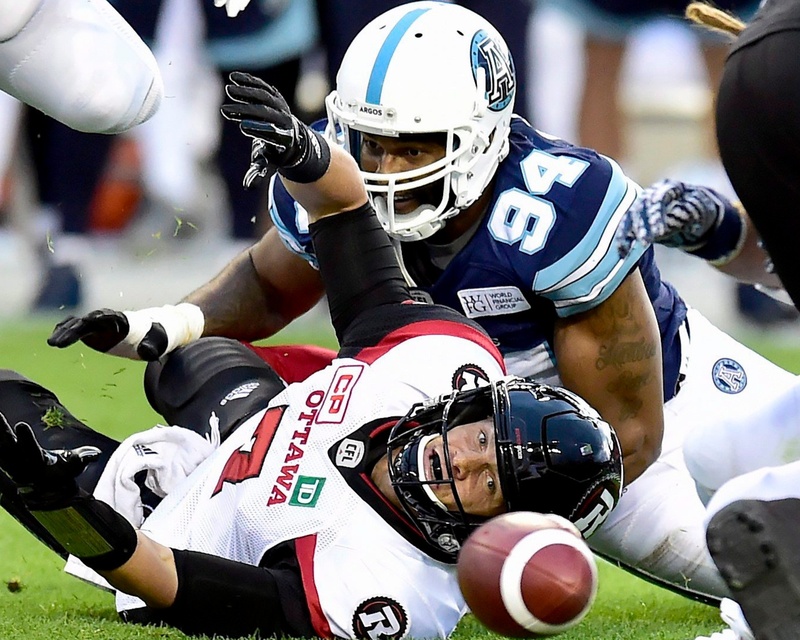 - Calgary’s Micah Johnson and Toronto’s Victor Butler are the only other players to garner three sacks in a single game this season. - There have been 591 drives this season. Teams have allowed at least one sack on 81 of those drives and have yet to score a touchdown when allowing a sack. - The touchdown percentage when a team has a drive without allowing a sack is 20%. - In the last 34 CFL games dating back to last season, a team has scored a touchdown while giving up a sack just two times. The two teams to do so are Saskatchewan and Montreal. - Toronto’s Ricky Ray is on pace to pass for 6,826 passing yards this season, which would break the CFL All-Time record set by Doug Flutie in 1991 (6,619). - Ray recorded his fifth-straight game of 300+ yards. His passing yards totals so far in 2017 are 506, 323, 366, 330 and 367. - Doug Flutie set the record for most 300-yard passing games in a season with 14 in 1991 with the Calgary Stampeders. Last season Mike Reilly led the league with 12. - Ray now has 83 career games with 300+ passing yards, trailing only Anthony Calvillo (125) and Henry Burris (93). - Ray completed 40 passes against the Ottawa REDBLACKS on Monday night – good enough for fifth all time. Ray trails Henry Burris (45) in 2015, Anthony Calvillo (44) in 2008, Dieter Brock (41) in 1981, and Kent Austin (41) in 1993 and (40) in 1992. - He is now the all-time passing completion percentage leader with 68.0%. - It was the second time in his career he attempted 50+ passes. His personal record is 56. - Ottawa’s Brad Sinopoli has recorded at least one reception in 42 consecutive games. He has caught a ball in every game he has played for Ottawa since joining the team in 2015. - #NoLeadIsSafe: On July 21st BC defeated Winnipeg, coming back from a 15-point deficit to match the largest comeback win in the last 57 CFL games, dating back to Hamilton’s 20-point comeback over Toronto last year on Labour Day. - 15 of 21 games have not been settled until the final three minutes. The average margin of victory is the lowest in CFL history at just 7.2 points. Ottawa is particularly notable having had five of their six games so far decided by a margin of four points or fewer. - 11 of 2017’s 21 games (or 52%) have been decided by margins of four points or fewer. - Penalties Down: 15.9 penalties per game, the 2017 average, is the lowest since 2013. - It’s Good: League-wide field goal percentage sits at 86.4%, the highest in CFL history. Sergio Castillo has made all nine of his 2017 attempts. Lirim Hajrullahu leads the league in scoring with 67 points. He’s on pace for 68 field goals this season, which would break the record currently held by Justin Medlock (60 in 2016). - Kickers have tried from 50+ yards eight times in 2017 and have made five of those attempts. - Jeremiah Johnson leads the league with six touchdowns and is the only player to score a touchdown in each of his team’s five games. Canadian receiver Terry Evanshen owns the record with 10 consecutive games with at least one touchdown. - Milt Stegall holds the most consecutive games with a touchdown in a single season with eight. - QUAR: BC Lions pivot Travis Lulay has the highest QUAR rating with 95.8.